SPC-701 Ultrasonic Set Point Controllers - Deeter Electronics Ltd. SPC-701 Ultrasonic Set Point Controllers - Deeter Electronics Ltd.
Set point controller. One adjustable set point. The SPC-701 is an adjustable control with 1 setpoint. The setpoint is independently adjusted, and has a Form C relay output. 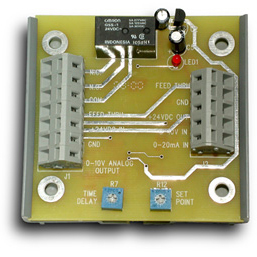 This control can be used with any sensor or device that produces a 0-20 mA, 4-20 mA, 0-10V or 2-10V analog output. The SPC-701 will work with all Migatron analog output sensors. Besides the 1 relay output, there is a 0-10V analog output. This output can be used to drive a meter or other analog drive controls. This analog output can feed a SPC-701 or SPC-704 to provide additional setpoints. The SPC-701 also provides 24 VDC excitation power at to drive input sensors. The SPC-701 has a signal averaging potentiometer that helps alleviate false trips during sudden signal changes. The SPC-701 can be mounted on Snap Track, DIN rail (with optional DIN mounting plate. Part #7942742 ) or four studs. The terminal blocks are press to open for easy wiring. There is an easy to view bright LED that show the relay status. The SPC-701 is powered by 24VDC. There is an isolated feed thru path across the board that can be used as a wiring aid. The relay output can handle up to 3 amps. Power On Status LED. Input: 24VDC, no sensor 30 mA, with sensor up to 2A. Excitation Power: 24VDC up to 2A.